The first historical reference of this place is to be found in the Domesday Book. In the reign of William II, the patronage was given to the Monastery of Sele (Beeding). 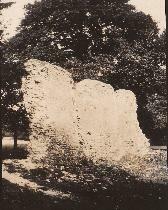 In Anglo-Saxon times, when Durrington was known as Derentun, there was a small Chapel of plaster and thatch. In the early Thirteenth Century this was replaced with a flint and stone building consisting of a chancel and nave, and probably roofed with Horsham tiles. This style would have been much in keeping with many smaller churches which still survive on the South Downs and coastal plain of Sussex. Documents survive which suggest the Chancel was separated from the nave by a rood screen. The Rood Screen was surmounted by a Solar (loft). Its main purpose was to accommodate a few choristers or a small organ. The steeple of the Chapel was built to carry the bell. This was little more than a raised bell cote above the gable end in a wooden structure. It was built in the western bay of the nave roof, and covered externally with boarding. The church remained much the same, with regular acts of worship, until the 1660's when the parish became caught up in the Civil War. The Revd William Stanley was an ardent Royalist while most of his parishioners were Cromwellians. Around 1643, the Chapel was partially demolished by the inhabitants of Durrington who did not see eye-to-eye with their incumbent (a somewhat drastic way to register displeasure with the Vicar!). In the years that followed it was suggested the Vicar neglected his duties and that he reviled the people of Durrington. He was accused of speaking maliciously to parishioners when they came to worship and the poor were constrained by threats and fears. By 1677, having been in decay for some years, the Chapel was declared unfit for the Divine Service. Despite attempts to repair the Chapel, it was eventually agreed that the people of Durrington be allowed to worship, baptize and bury at Tarring Church. On 24 January 1680, with the agreement of both parishes, the then Dean of Chichester, Dr Thomas Briggs, took steps to unite Durrington to Tarring Church. Records show that the Chapel was still occasionally used for many years. In 1890 the Revd Canon Henry Bailey, Rector of Tarring, erected a small Mission Room at his own expense and left it in trust to the inhabitants of Durrington for worship. It was built adjoining the east wall of the ruined Chapel and afternoon services were held every Sunday at 3.30pm and Holy Communion at 8am on the last Sunday of the month. Towards the latter part of the Nineteenth Century thoughts turned to restoring the Chapel and fundraising began. Unfortunately the fundraising came to an end when the Revd Dr Springett, Rector of Tarring, and the person leading the fund raising effort, was moved to Brixton in 1898. When extensive repairs were needed to the Mission Room, enthusiasm was rekindled for the restoration work and on 14 July 1914 the Ancient Township and Chappelry of Durrington was constituted as a separate Ecclesiastical Parish. The Revd William Edward Dixon Penfold was appointed Vicar of Durrington and during his early ministry work began on the restoration of the church. Part of the old building was incorporated into the present one, using the foundation of the north wall, and part of the south and west walls and extending the nave. The dedication of the original church is unknown but on 13 October 1915 the new church was dedicated to St Symphorian and was consecrated on 15 December 1916. 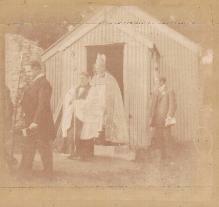 The chancel and vestries were added and the final work was dedicated by Bishop George Bell on 3 September 1941. In 1954 choir stalls were added to the Nave. A pulpit and lectern were also purchased for the church. In September 1969 pews were added to the Nave. These were donated by a redundant church in Newhaven. In 2005 the Lady Chapel was reordered and a new Tabernacle donated to the church. This was the start of a regeneration of the church facilities. In 2005 reordering began in the Nave with the removal of the pulpit and the main Altar being relocated into the Nave. New disabled facilities were added in 2006 and the church organ was also refurbished. In 2010 the church roof was tiled on the south side of the Nave, the church porch and over the Baptistery. This was followed in 2011 with the pews being removed from the Nave of the Church and upholstered chairs being installed. The axis of the church was also changed with the Altar being placed on the north wall. The new layout enabled new activities to be undertaken in the Church and in addition to worship it is now used for some social events and concerts. Having reverted to the original ordering of the church, In 2015 the Bishop of Chichester gifted the High Altar from All Souls’ Church in Hastings which now sits at the east end of the church with a Nave Altar having been added. In 2017 the roof project was completed. Today work continues to maintain the building to be a witness to the glory of God and fit for worship.